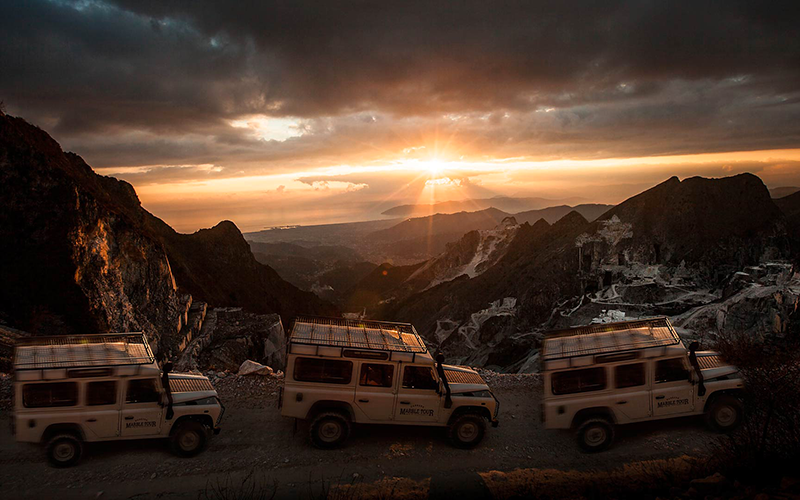 Carrara Marble Tour is pleased to offer you a terrific off road 4×4 trip in the stunning scenery of the Carrara marble basins, where some scenes of the James Bond Quantum of Solace film were shooted in 2008. With our professional drivers and tour guides, you will experience the thrill of travelling along winding, steep roads (usually inaccessible to most visitors) together with the trucks that, during the working days, transport the marble blocks downhill. A unique, once in a life experience in which you will witness the ongoing battle between man and the majestic mountains that keep this precious material at their inside.